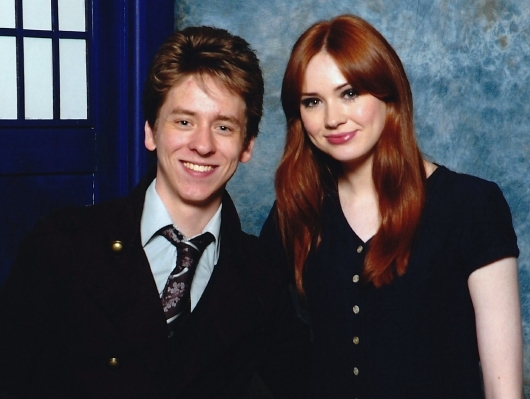 I met Karen Gillan in July 2011, when she was a guest at the London Film & Comic Convention held at Earl's Court, London. She signed a photo for me, of her as Amy Pond in Doctor Who. her secondary school, Charleston Academy, where she also learnt the piano. She had a good singing voice too, but by the age of 16, had set her mind on a career as an actress. been at the college a matter of weeks when the opportunity to play Teri Cotter in an episode of the BBC's crime series Rebus proved to be too tempting, and she left. was talent-spotted as a model. She became the face of trendy fashion house Boing for a short while, and later becoming a catwalk model for top designer Allegra Hicks. She modelled some of Hick's autumn/winter collection during the 2007 London Fashion Week. (2008). She eventually landed an ongoing role in 12 episodes of the comedy sketch series The Kevin Bishop Show (2008-2009). In this she played various characters and also impersonated celebs like Katy Perry & Angelina Jolie. Karen was then cast as Coll in 4 episodes of the TV thriller The Well (2009) and as Ally in the modern-day Scottish horror movie Outcast (2010). sought-after in television because of the enormous popularity of the series and the huge public profile that it gives to the actor or actress playing it. Apparently, they had never met before Doctor Who - only discovering during their auditions that they were cousins. 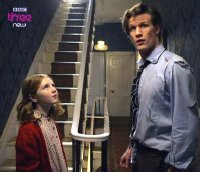 Karen's first appearance as Amy Pond came in the episode 'The Eleventh Hour', (aired on 3 April 2010) when she appeared in a 'strippogram' WPC costume. Her character will remain in the series until she is written out in 2012.
comedy film Not Another Happy Ending (for release in 2012). Warehouse in London in October 2011. "What’s strange is that they were following my boyfriend and I just happened to turn up!" she says.